Brown the butter in a saucepan until nutty and golden, add sage leaves and lemon juice. 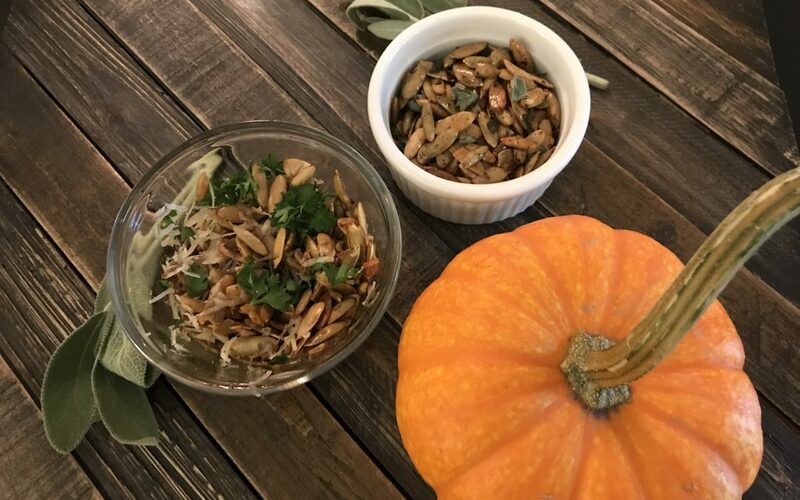 Toss with pumpkin seeds and spread onto a parchment lined baking sheet, sprinkle with salt and pepper and bake at 325 for about 20 minutes. Melt butter, add olive oil and sautéed garlic for a few minutes until fragrant and soft, add red pepper flakes. Toss with pumpkin seeds, salt and pepper, spread on a baking sheet lined with parchment at 325 for about 20 minutes. Cool until just warm and toss with cheese and herbs.